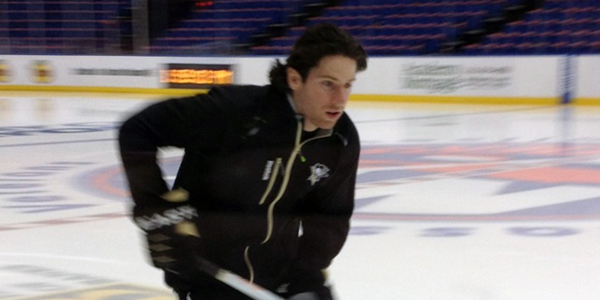 Update 2:48 PM: Penguins forward James Neal returned shortly to team practice Saturday at Nassau Coliseum. He skated for a few minutes with the team before leaving the ice. Prior to practice he skated a few laps on the ice for roughly 10 minutes in warmups. Neal hasn’t played or practiced with the team since leaving Game 1 halfway through the second period. It is the Penguins team policy to give no injury updates or information during the playoffs. Brooks Orpik and Evgeni Malkin were the only two Penguins that did not practice. Head coach Dan Bylsma did not discuss their absence or status.